Arsene let a few of his kids loose at the Emirates last night, and they were just about good enough to defeat a mediocre Bucharest outfit. Theo Walcott missed a few good chances, but Niklas Bendtner scored and seems to be progressing nicely, although I’m not sure he’ll ever be a world beater. Even better for Arse fans, Robin van Persie returned from injury and looked surprisingly sharp in the 60-odd minutes he was on the pitch. The Dutchman makes such a huge difference to Arsenal â€“Â if he and Cesc Fabregas stay fit for the rest of the season, they still have a slim chance of winning the league; otherwise, forget it. 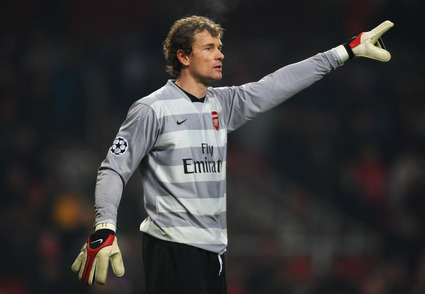 There was also a rare outing for Mad Jens Lehmann (pictured), aka the crazy uncle you want to avoid at Christmas parties.